When system C drive in Windows Server 2008 runs out of space and low disk space warning pops up, the fastest way is resizing the system C drive with partition magic server software. I believe that nobody would like to waste the happy weekend to start over, furthermore, it may cause data loss when rebuilding the Server. By resizing the C drive, you can change the partition size quickly without starting from scratch. That is to say, shrink other data partition and get some free "Unallocated" space and then add to the system C drive. All files, shortcuts and everything keeps intact and no other operations are required, what you need is a reliable partitioning utility. The security and stability are undoubtedly the most significant aspect for Server computers since a Server computer usually stores the most important classified and daily-used files. However, even a slight error on Server computer might directly leads to exposure of the whole network to the outside. So you'd better select a reliable Server partition software to resize C drive on your Windows 2008 Server. 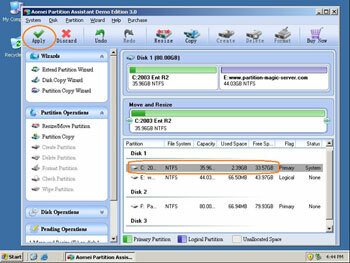 With the unique Enhanced Data Protection technology, Disk/Partition Copy Wizard and Partition Recovery Wizard features built-in Partition Magic Server, you don't need to worry about the data security when resizing your Server disk partitions. – It is extremely easy to resize C drive in Windows 2008 Server. You just need to drag and move on the disk map to shrink an existing data partition to get some Unallocated space, and then you can extend C drie with this space. There is no need to delete, format partitions or rebuild the Server. – Any operations you do on the Server will be listed in the "Operations Pending" column and no changes will take place on your partitions before you click "Apply". – If the system C drive is NTFS, you can extend it without rebooting Server. No data drives in the same hard disk. You cannot get enough free space in next contiguous partition. Don't worry, this partition magic server software provides multi-ways resizing C drive in Windows 2008 server, refer the complete solution of resizing server 2008 partitions. Enhanced data protection technology helps you resize, merge partition without data loss. Hot Resize feature helps you extend NTFS system partition without rebooting. Changes made on partitions can be previewed before applying to avoid incorrect operations. Easy to use, just dragging and drawing on the disk map to resize partitions. Download this server magic free trial and check how easy it is to resize C drive in Windows 2008 Server.